There have been a lot of rumours surrounding Apple TV and what we can expect in the coming years, as many companies try to push their consoles and TVs into the living room. Apple wants a new engineering manager for the Apple TV, on the website they asked for a “lead a team of engineers working on exciting new features and functionality.” and have stepped up the TV to a high priority project. This step up in the project shows that Apple see the TV as relevant and needed. With iOS getting stale and iPhone sales stagnating, the company, with about $110 billion in the bank, are starting to look a little frail and old. Many analysts believe Apple could push their stock up by announcing the Apple TV with gaming console capabilities and maybe an inbuilt box set that has digital on-demand and streaming features. Everything is open for discussion when it comes to the next generation of Apple TVs. Many still believe Apple will make the service like an all-in-one TV, with digital games, movies and TV packaged inside an actual television. This could be the case, we have heard rumours that Apple are looking for television companies to acquire or to partner with for this TV project. We suspect like all of Apple’s gadgets, they will be built and manufactured so only Apple can own it, Samsung and other manufacturers will not get a cut. 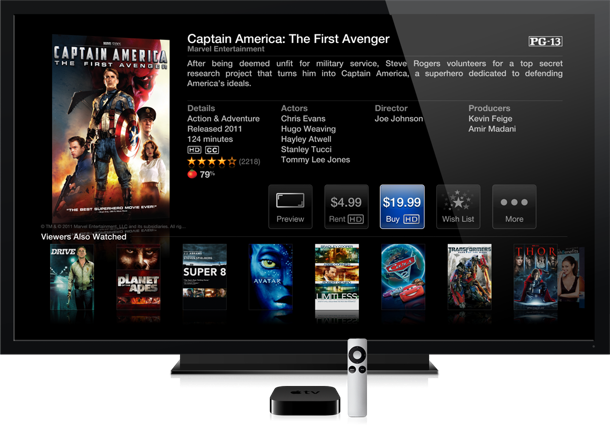 Apple TV could continue with the box design, and like OnLive all the power will come from servers. They could make the Apple TV a lot larger, to run more complex applications and games on the system without streaming. Like we said, all of these ideas are open for Apple to dive into, the one thing we hope is we see some definitive move into the living room by Apple in the next few years, before Valve, Microsoft, Sony and Google all make their plunge.